Makurdi — Two National Youth Service Corps, NYSC, members died, yesterday, while four others are in critical condition at a hospital in Gwer Local Government Area of Benue State, following an accident involving a 14-seater bus, which crashed into a farmland on Makurdi-Aliade Road. The ill-fated vehicle, a Volkswagen bus belonging to the Anglican Communion, Diocese of Otukpo, plate number Benue AE 135 JUX, was conveying the corps members from the Benue State Orientation Camp in Wannune, to their places of primary assignment in Otukpo. An eyewitness told Vanguard that the driver of the bus, conveying the 14 corps members apparently fell asleep while on top speed, "and all we saw was that the bus skidded off the road and somersaulted several times in the bush." He said members of the Igbor community rushed to the scene to rescue the victims. 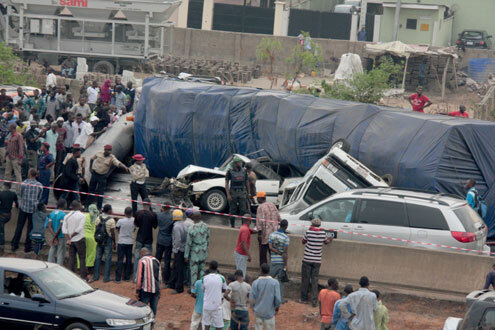 He said: "When we got there, we alerted the Federal Road Safety Commission, FRSC, which also rushed to the scene. "As we axed the bus, we discovered that two of the occupants were dead, while others were rushed to Saint Vincent Hospital Aliade for treatment." Among the early callers at the hospital, where nine of the victims were recuperating, was Governor Gabriel Suswam, who lamented the unfortunate incident. Governor Suswam, who also visited the state secretariat of NYSC in Makurdi, directed that the victims be transferred to the Benue State University Teaching Hospital, Makur-di, for further treatment. When contacted, Benue State Public Relations Officer of NYSC, Mr. Chidi Nnorom, confirmed the deaths.